High-energy atmosphere. Contemporary style. Superbly crafted menu. What's not to love? Check out our sushi menu, and stop by today to sample some of our award-winning sushi! We offer daily deals on more than 300 fine wines and a wide selection of premium sake, micro-brews, and spirits. Complement your delicious Japanese food with a delicious beverage! Our vibe is reminiscent of an upscale New York City restaurant. Our stylish establishment is perfect for couples, families, friends, and private events. Come see for yourself! Our restaurant features a sushi bar and dinner seating, a full bar, patio/outdoor dining, a private dining room, a spectacular view of the city, and takeout services. We are a non-smoking establishment with wheelchair accessibility. While we offer a more than 300 wines, we also welcome personal wines with an applicable corkage fee. In addition to our regular restaurant services, we offer dancing and entertainment. We feature a live DJ on Friday and Saturday nights. Come see why we are consistently recognized as being one of the best Japanese restaurants in Charlotte. At Nikko Japanese Restaurant & Sushi Bar, you can expect a truly stimulating experience. On weekends, look forward to hip-hop spun by a DJ, bright lights, and owner Joanna dancing her way through sake bombs with her signature boa and cowboy hat … Not to mention the seriously good sushi and other Japanese food! The spicy tuna rolls are the perfect combination of creamy with a slight bite, and the nigiri features fresh fish perfectly sliced for the best texture and taste. Plus, we are always coming up with new and inventive sushi rolls, such as the Charlotte Roll, which consists of tempura white fish, lettuce, and garlic sauce. 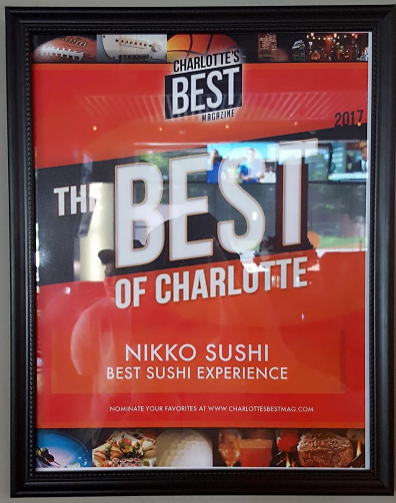 Come see for yourself why we’re the best sushi restaurant in the great city of Charlotte.